ReservationsONLINE eliminates the cost of software purchases, eliminates the cost of software support contracts, and eliminates the cost of continual software upgrades. These cost savings combined with higher occupancy rates and improved customer service and the inherent time savings in record keeping makes ReservationsONLINE practical for even the smallest of properties and a perfect choice for small to medium sized properties. 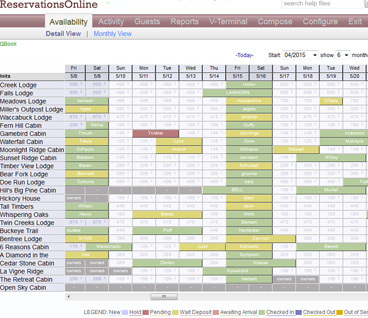 ReservationsONLINE's Graphical Reservation Calendar allows you to visually manage your reservations easily. Your occupancy, rates and booking rules along with name and the status of existing reservations is all available at a glance. Click on an existing reservation to review guest history, modify dates or change units, check-in, check-out, received deposits or payments, or print Guest Reports. Click on an open unit to quickly and efficiently enter a new reservation. Every change in availability and rates is immediately reflected in the Internet Booking Engine. Every Internet booking is immediately reflected in your Reservation Calendar. ReservationsONLINE recognizes the fact that repeat guests and referrals from guests are your most profitable customers. 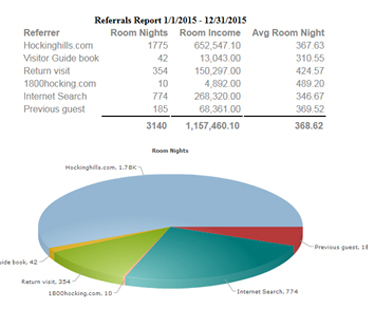 ReservationsONLINE's ability to effectively record, present, and act on detailed guest history greatly increases your chances of having repeat guests and referrals from guests. Providing better customer service and better customer follow-up is a major focus of ReservationsONLINE. 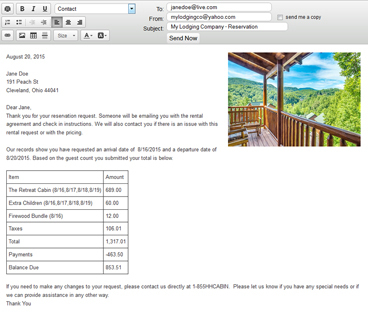 ReservationsONLINE's Guest Letters handle the printed and email interaction with your guests. You can completely customize the wording and appearance of all your Guest Letters. Numerous Guest Letters are available, each created specifically to handle a stage of the reservation process: initial contact, deposit or contract request, check-in, check-out, cancellations, etc. Additionally ReservationsONLINE provides follow-up and marketing Guest Letters. From the Contact screen you have the ability to select any collection of guests and either email them or print them a letter for mailing. For example, a week after all guests check out send them a thank you note. Or, 6 weeks before a guest's anniversary send them an invitation to repeat their visit again this year. Or, perhaps during the off-season send a promotional offer to all previous guests within a 100 mile radius of your property. ReservationsONLINE turns more guests into repeat guests. From day to day operations, to managing your time, to managing your money, to planning your future, ReservationsONLINE's set of Business Reports are there to help you operate the business side of your business. ReservationsONLINE's reports are both focused and informative while their appearance is professional. You can save your Business Reports as PDF documents, Word Documents, Excel Spreadsheets or output them to any printer connected to your workstation or network. Schedule Housekeeping Reports to run at predefined intervals - nightly, weekly, or monthly - and be emailed to you or your support staff. If by chance ReservationsONLINE doesn't have the Business Report you need, our programmers can build custom reports for you. Click here for details about ReservationsONLINE's Integrated Internet Booking Engine.